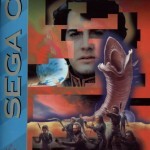 Dune on the Sega CD casts you as Paul Atreides, the son of a powerful duke. The Atreides family has been sent to the desert planet Arrakis by the Padishah Emperor Shaddam IV to mine the mysterious narcotic known as Spice. As Paul, your job is to persuade the native Fremen people to work for you as miners and soldiers in order to mine Spice and to defend against your arch-enemy Baron Harkonnen. Those of you familiar with the novel, David Lynch’s 1984 film or the Sci-Fi Channel’s mini-series will instantly appreciate that nothing on Arrakis, or Dune, to give the planet its informal name – is quite what it appears. For those of you unfamiliar with the plot, I won’t spoil it for you here except to say that nothing on Arrakis – or Dune – is quite what it appears! Dune is an adventure game with some strategy elements. The main part sees you talking to other in-game characters who’ll give you instructions or clues on where to go to, or whom to speak to, next in order to progress the plot. Sticking very closely to the source material, the adventure parts are actually quite linear, and while you can go wandering off into the desert, visit other places or speak to anyone you like in any order, doing so is pretty pointless as it will not progress the game. This isn’t in itself a bad thing, as stories, after all, are typically linear affairs. However, what this adventure lacks is much in the way of challenge or puzzle solving. From start to finish you’re basically led by the hand through the game and told very explicitly what you need to do next, with little need to engage any grey-matter. On the very few occasions where you are asked to think, it actually come as more of an annoyance, since up until that point you haven’t had to. The pace of the game starts off slowly and never really increases in speed. It doesn’t exactly plod, but there’s no real sense of urgency, nothing really to get your heart pounding or your trigger finger twitching. It’s more relaxing than anything else. The strategy elements of Dune are all about resource management. You start off assigning the Fremen to mining duties, directing them to high yield Spice fields. As the game slowly progresses, you are able to employ the Fremen as prospectors to search out new Spice fields, buy and deploy harvesters and other equipment to increase Spice production, enlist the Fremen to fight for you against the Harkonnen and, very late in the game, transform the planet’s ecology. Linked as they are to the game’s main plot, these strategy elements are eked out at the same leisurely pace. Compared even to games of the same era, they are pretty light-weight. Again, the right action to take is almost always obvious at any given point as the game unfolds. After about three hours of this light gameplay and somewhat soothing pace, you might well begin to wonder what Dune is all about; I certainly did. It struck me that Dune is not so much a video game as we might understand video games, but more of an interactive retelling of Frank Herbert’s Sci-Fi classic. The question then remains: how good a retelling of the story is this? As far as presentation goes, Dune is almost faultless. Lynch’s film was clearly the inspiration behind the game’s art design, with many of the locations looking very much like the sumptuous sets used in the film, with even some of the characters looking very much like they do in the film. Paul, for instance, bears an almost uncanny resemblance to a young Kyle MacLachlan. Cementing this relationship even further is the inclusion of FMV segments lifted directly from the film and presented in full grain-‘o-vision. What’s great about these sorts of highly stylized visuals is that they have an almost timeless quality; they don’t take you back to the early 1990s but rather off to the far distant future, to Arrakis, to Dune. The voice acting is generally very good, although some of the samples have that “recorded in the bathroom” echo to them, and who knows, perhaps with budgetary constraints they were! Fortunately, it’s nothing to seriously detract from the overall quality. The soundtrack is very nice too; it’s a sort of mellow space jazz which perfectly fits the pacing of the game. Visually and aurally then, Dune is quite polished. This polish is carried through to the interface with an uncluttered and easy to navigate menu system. You play the game either in the first-person using a simple north, south, east, west direction system, using a context sensitive menu as appropriate, or via a map and command type screen. Both are very easy to use. The plot, much like the visual style, is inspired more by the film than the novel. Some license has been taken here and there, especially with the exclusion of certain characters and the roles others take, but generally it’s fairly faithful to the film, which in turn was fairly faithful to the novel. The developers clearly understood that the source material didn’t need too much tinkering with to create an immersive and compelling story and ultimately that’s where this retelling succeeds. As a game, it’s difficult to recommend Dune. It’s not that the game elements are bad but, despite all the style and polish. There simply isn’t enough actual game here to warrant a purchase. Those looking for a Dune-themed game would do better to investigate Westwood’s excellent RTS released around the same time. As an interactive retelling of the classic, Dune has far more promise. For those unfamiliar with Dune I wouldn’t recommend it as an introduction to Herbert’s universe, but would instead point you towards the novel first and then perhaps the film or television series. For those of you who know Dune inside and out, who have read the novels, watched the film, seen the television series and who want to experience it from a new perspective, this is a perfect opportunity to do so. Who knows, maybe they’ll become the Kwisatz Haderach! for the Sega CD, Dune is a solid title. Possibly the most in-depth game I’ve played on the console, although I’ve yet to play the Lunar games. If you’ve played Rise Of The Dragon and liked it, then you’ll love this. a 10/10 in my book. The presentation is very nice, but as a game, Dune is pretty bland. Don’t make the mistake to compare this title to the far superior “Dune – Battle for Arrakis”, as the two games are nothing alike.